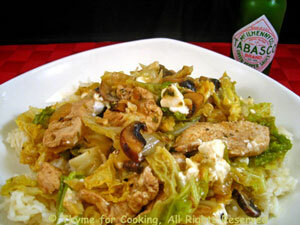 Chicken Breasts with Savoy Cabbage and Feta, Thyme for Cooking easy recipes. I love Savoy cabbage - especially the fact that it cooks so fast, perfect for stir-fries.... And skillet dinners! Cook rice in chicken stock, covered, until done, about 15 minutes. Cut a slice off the cabbage, cut the slice into thirds, then slice thinly. Heat oil in large skillet. Add onions, celery, paprika, cumin and stir-fry 5 minutes. Add chicken, mushrooms, garlic, and stir-fry 5 minutes longer. Add cabbage, stock, sherry, oregano and stir well. Reduce heat, cover and simmer for 15 minutes. Add feta, stir briefly and remove from heat. Spoon over rice to serve.